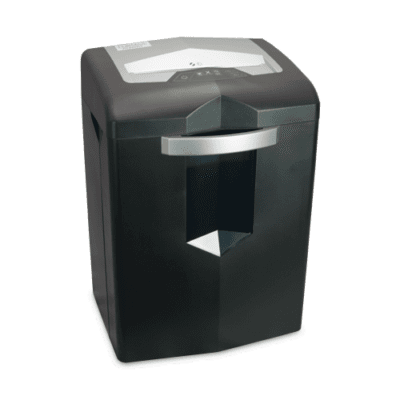 The Formax FD 8204CC Deskside Shredder is as compact as a wastebasket, with enough power to handle CDs, paper clips, staples and credit cards. 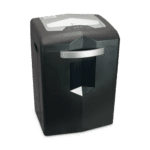 This rugged cross-cut model provides on-the-spot destruction of sensitive paperwork, phone messages and notes generated throughout the day. This cross-cut model can shred up to 17 sheets at a time, up to 7.5 feet per minute, with a shred size of 5/32" x 1 3/8". The new design is also quieter than its predecessor. The FD 8204CC is ideal for busy professionals or the small home office. Key FeaturesAutoStart/AutoStop. Up to 17 sheets at once. CDs, credit cards, staples. Quiet operation.